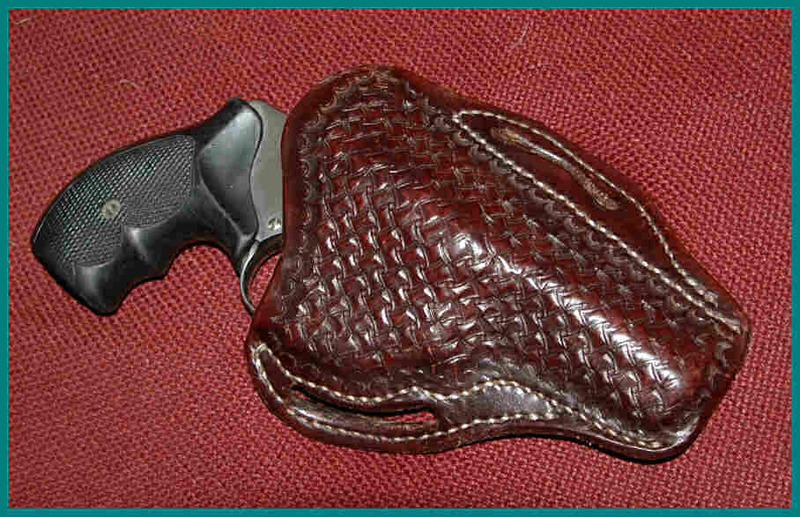 Kate's Comfort Pancake, in vegetable tanned horsehide from Siegel of California. 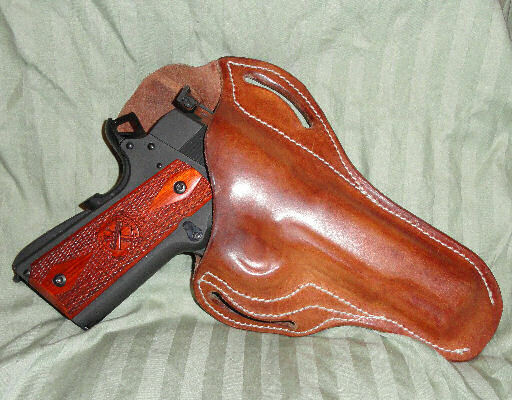 Unique crazy leg stamping, Marine Cordovan dye and hand rubbed waxed finish. 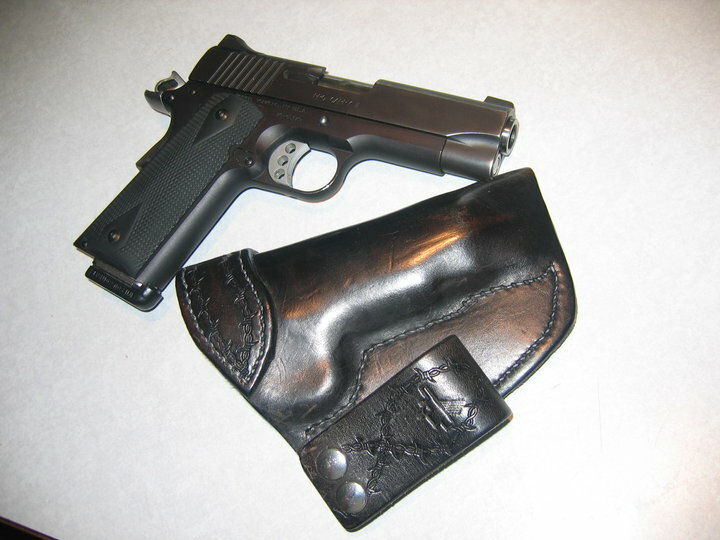 Crossdraw carry (for a right handed person) with a comfortable, secure and accessible FBI forward tilt. 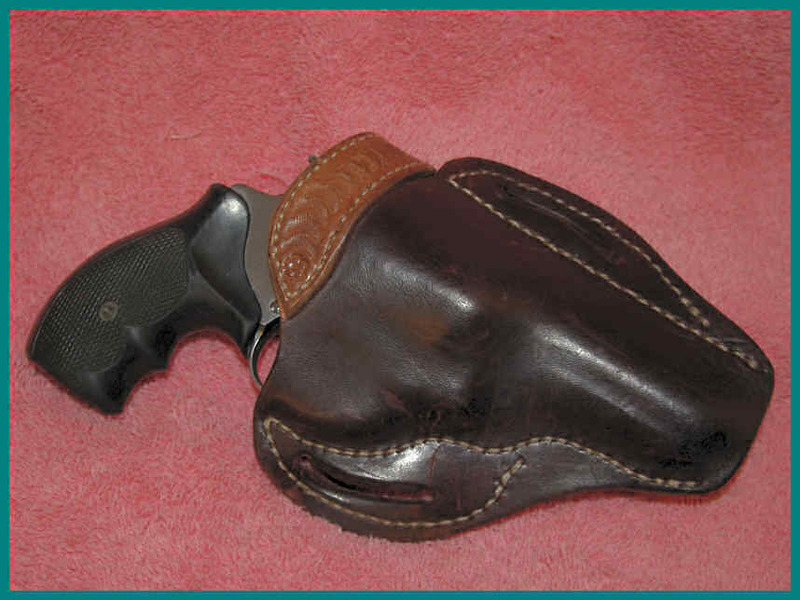 This holster style is effective for women as well as men, as it simply disappears beneath the bust line under a sweater, sweatshirt or vest. 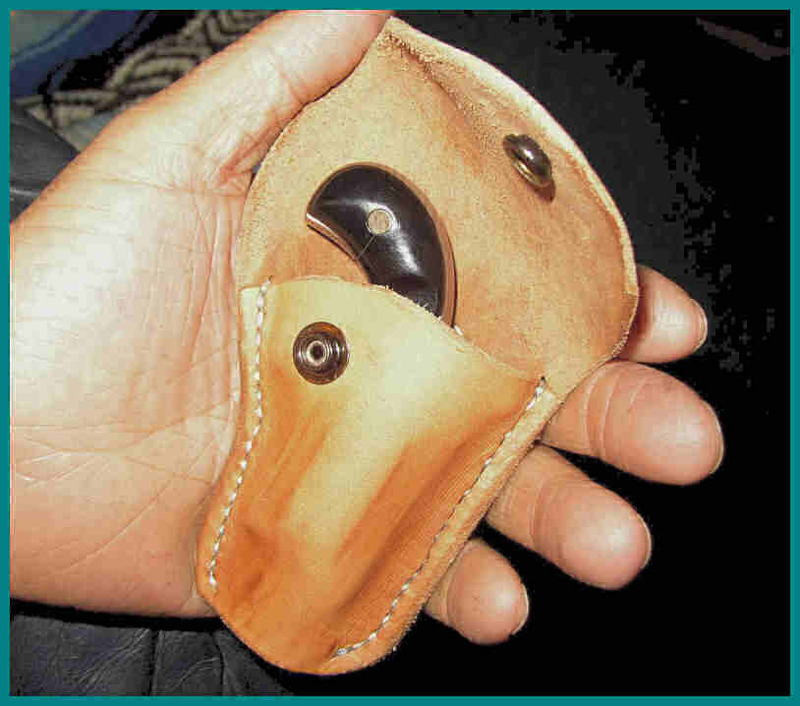 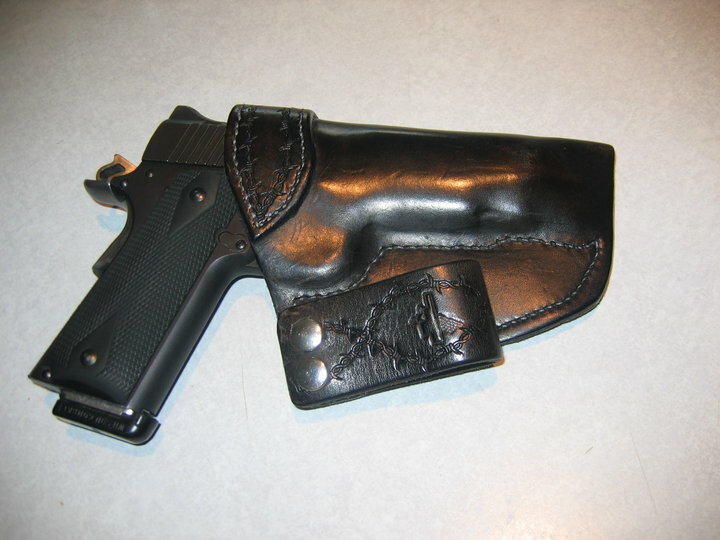 This particular holster is over eight years old - look at how well it is holding up to constant use! 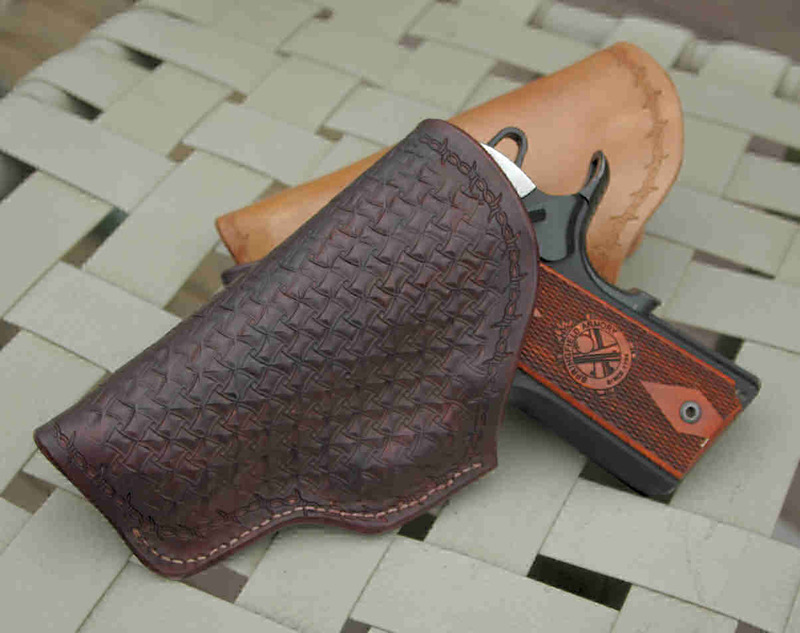 The beeswax and neatsfoot leather treatment makes it essentially weatherproof, and the finish just gets better with age and use. 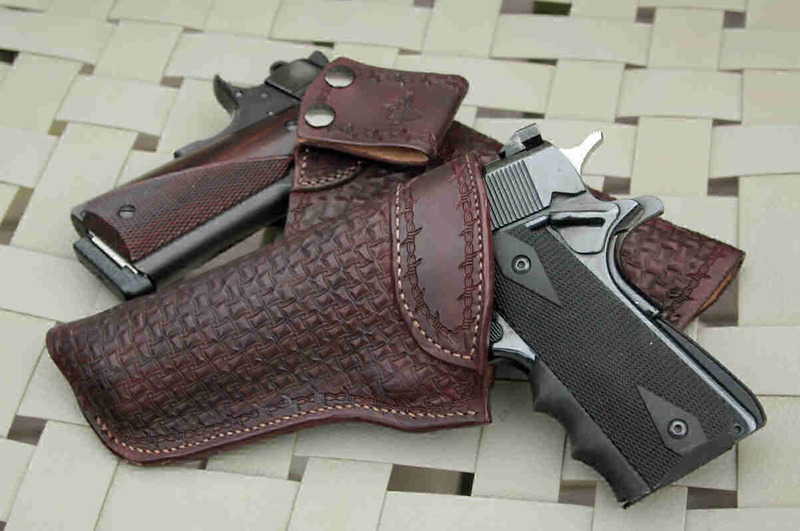 This finish is great over dyed leather, and even better over natural un-dyed horsehide. 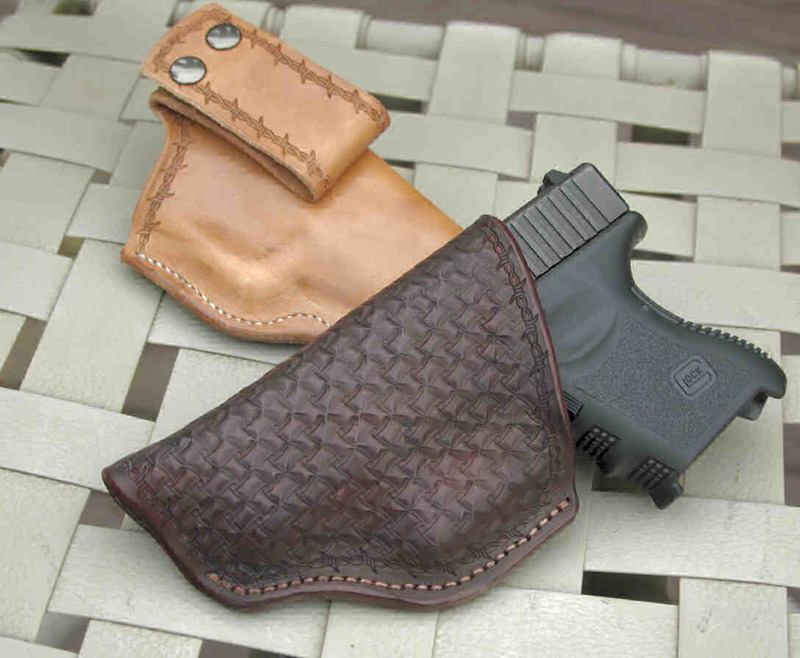 Great for all day wear while driving, sitting or more strenuous activities, this model provides outstanding firearm retention without straps, snaps or other gadgetry of hardware. 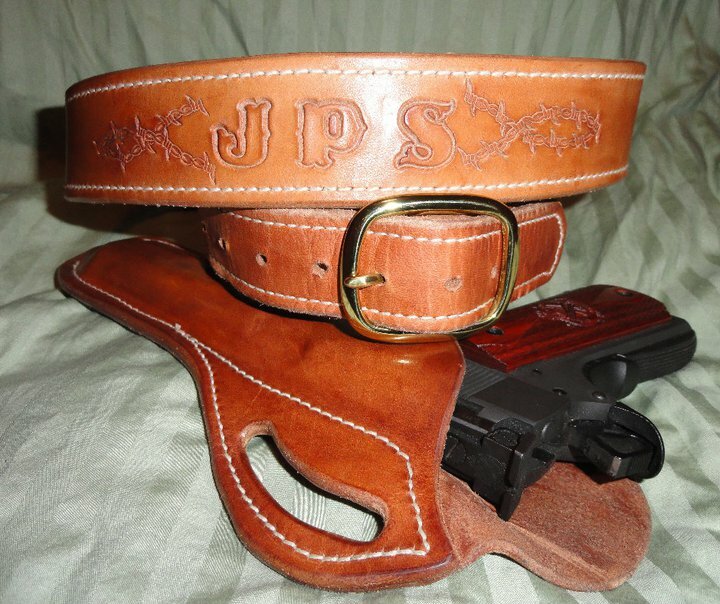 Once your belt cinches down on the "ears", it securely grips the gun to prevent unintentional extraction - yet it is an easy smooth draw when needed. 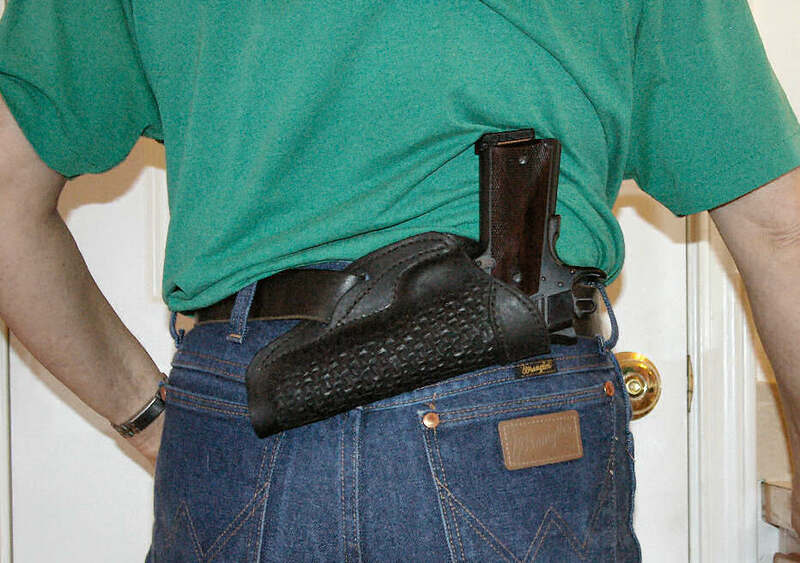 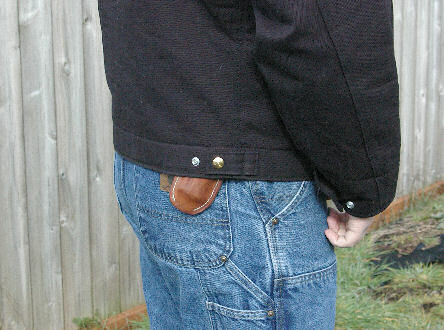 For me, a short-waisted woman with arthritis in my strong side (right) shoulder, the waist carry cross-draw option allows me the security of great concealment and knowing I can get my gun out of the holster easily if needed - clearing leather on a strong-side belt holster is just not possible for me. 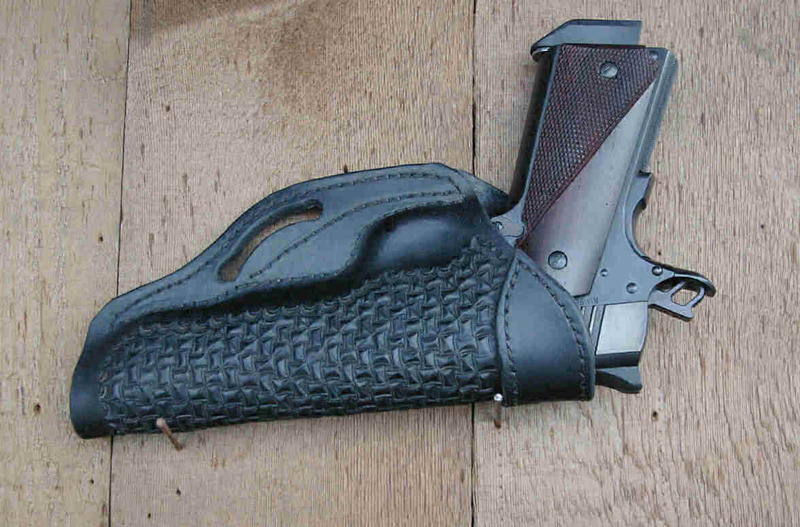 Here's another version, my Banded Pancake, again for the S&W Model 60. 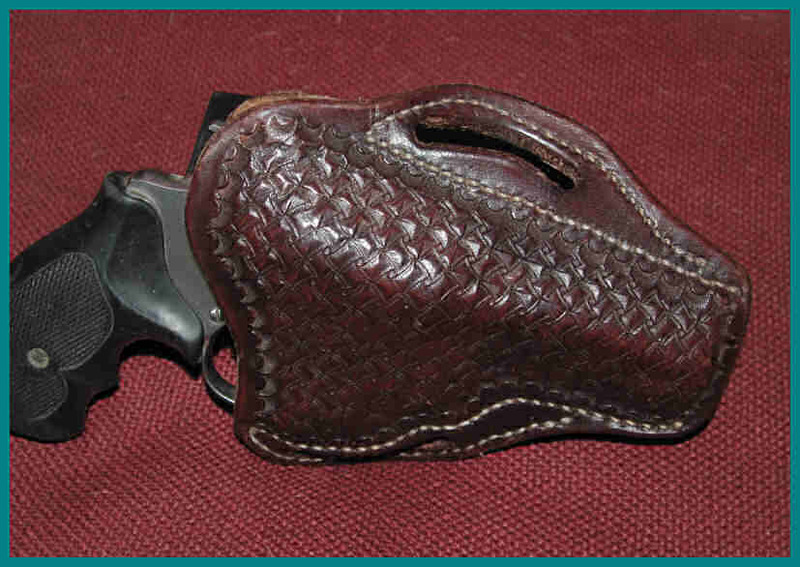 This model is particularly suited to small frame revolvers, but also translates nicely for the small .380 semi-auto types. 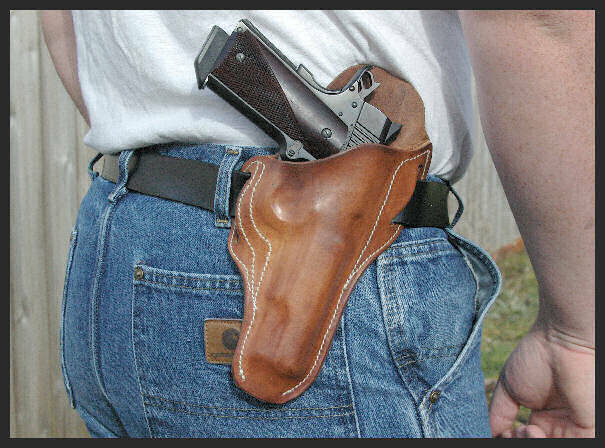 This basic idea also translates to a comfortable belt carry for a larger revolver. 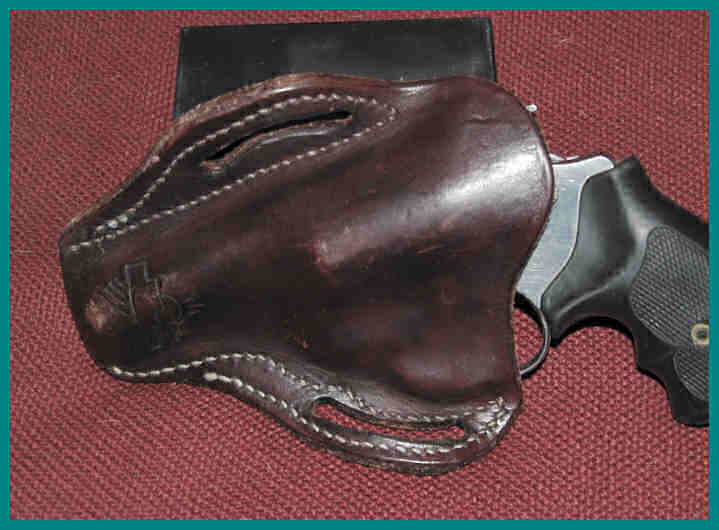 Here it is modified for a S&W 686+, the seven shot .357 revolver with four inch barrel, which is a nice hunting sidearm. 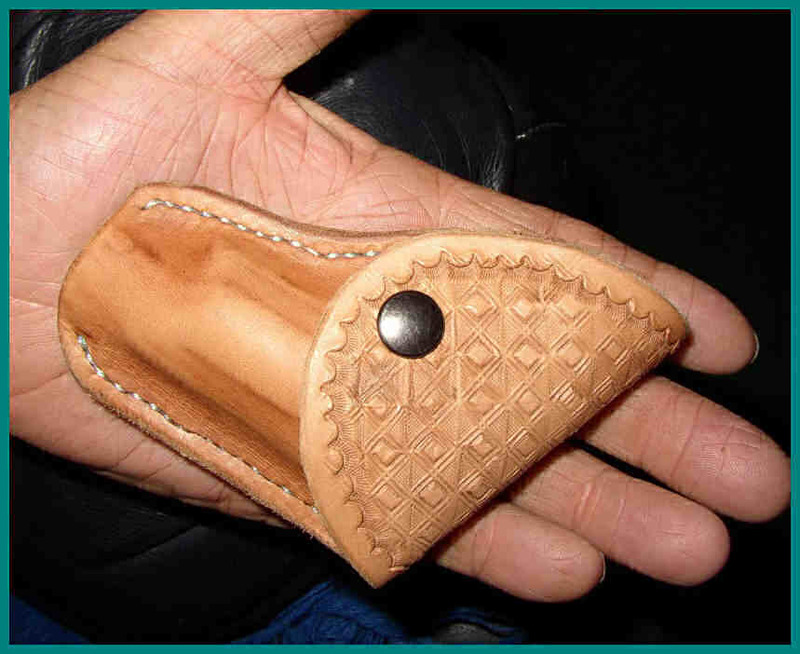 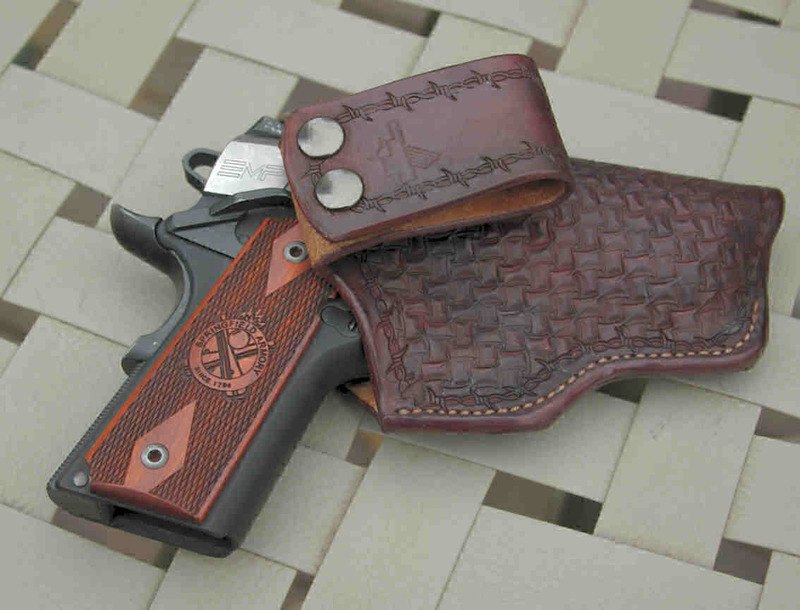 Pricing for hand-shaped plain pancake holsters start at $125, more for stamping, linings or special requests. 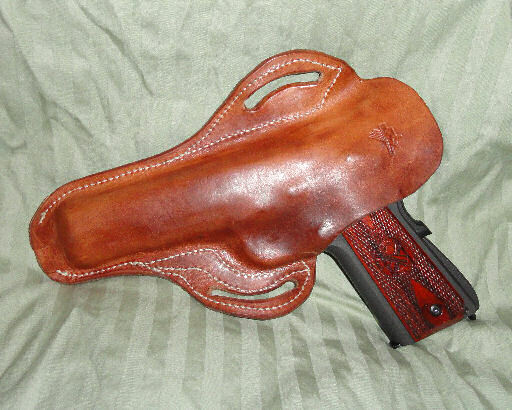 This was a special custom-carry request. 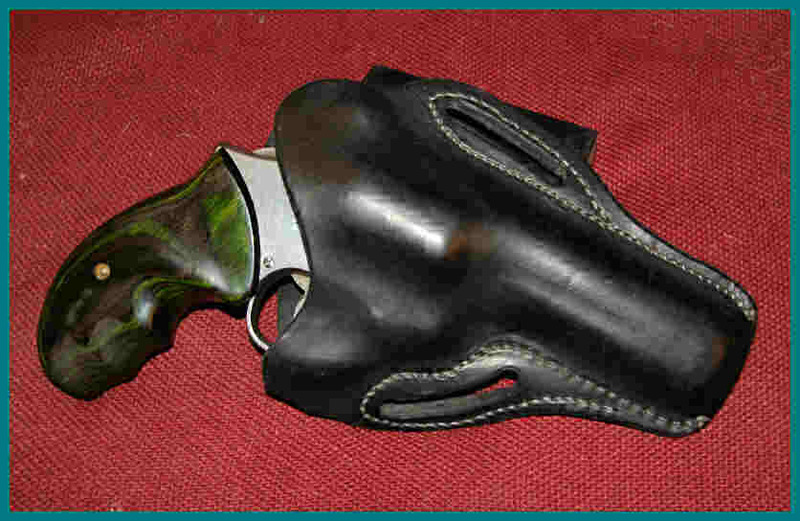 Custom option "Muffin Top Protector" to keep those sharp target sights from biting! 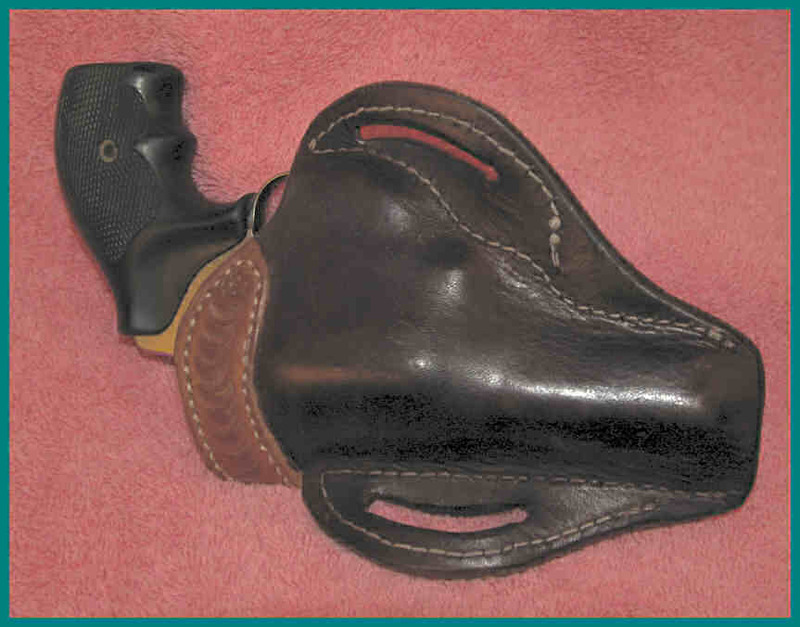 I have done a bit of western leather, as well as historical reproductions. 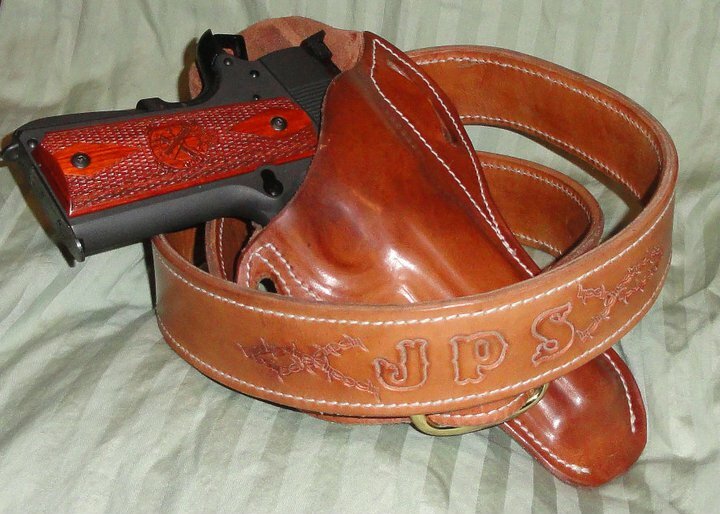 I also do custom bridle work.